The Codex Gigas is the largest medieval manuscript in the world. However, it's not the size of the book that makes it remarkable. MICHAL CIZEK/AFP/Getty ImagesThe Codex Gigas, also known as the Devil’s Bible. 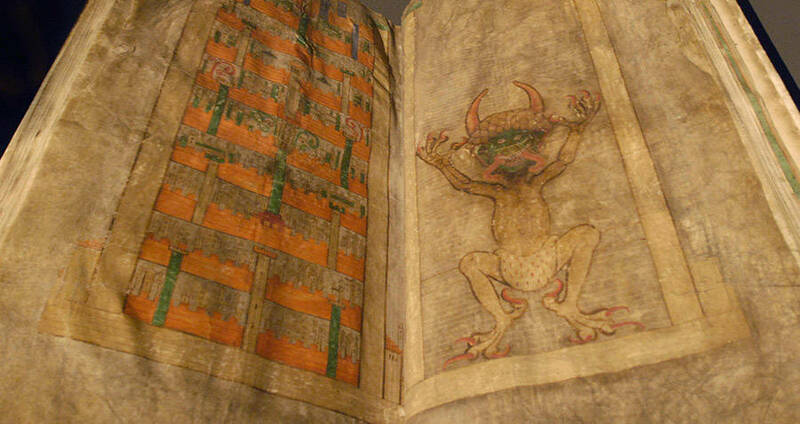 The Codex Gigas sits on display at the National Library of Sweden in Stockholm. This leather-bound book is the largest surviving European manuscript in the world believed to have been written by a monk in Bohemia during the early 13th century. However, this behemoth manuscript, sitting at 36 inches tall, 20 inches wide, and close to nine inches thick, is famous not only for its size. Featuring a large, full-page rendition of Satan, the book was given the nickname The Devil’s Bible and inspired legends about the true nature of its making. In its entirety, the Codex Gigas contains the Old and New Testament, The Antiquities and The Jewish War by Flavius Josephus, the Encyclopaedia, the Chronicle of Bohemia by Cosmas, some medical texts, and a collection of some shorter works. It is also believed to have once contained the Rule of St Benedict, but that work has since been lost. The most striking piece of the manuscript is in the middle of the text: a large and terrifying portrait of the Devil himself. The image of the Devil is opposite a rendering of the Kingdom of Heaven. The size of the Devil is striking, as he takes up the entirety of Hell. 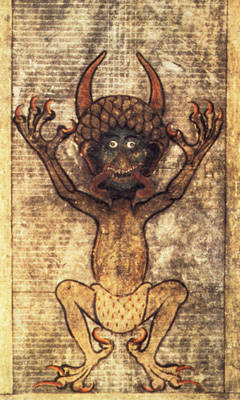 He is depicted as having large claws, red-tipped horns, a green head, small eyes with red pupils, and two long red tongues. At the end of the Thirty Years War, Sweden looted Prague and took the entirety of the collections of Emperor Rudolf II, including the Codex Gigas. It displayed at the Swedish Royal Library from 1649 to 2007 and was briefly loaned back to Prague and placed on display at the Czech National Library from 2007 to 2008. According to research, due to its size and precision, many believe the book must have taken over twenty years to complete or at least five years of non-stop writing. However, the Codex is also notable because of the uniform nature of its writing, which seems to indicate that the book was written all at once over a very short period of time. The legend goes that it was completed in a single night by a monk known as Herman the Recluse. After breaking his monastic vows, the monk was sentenced to death by being walled up. Attempting to save his own life, he made a deal that he would write a book complete with all of the world’s human knowledge in exchange for his freedom. The catch was that he only had one night to complete it. Facing this impossible task, the monk called on the Devil to help complete the book in exchange for his soul. The book was finished with the help of Satan himself and the large portrait was included in the middle of the book supposedly as a tribute to its true author. Although the actual author of the book may never be known, the unique portrait has been drawing attention since its creation over seven hundred years ago. 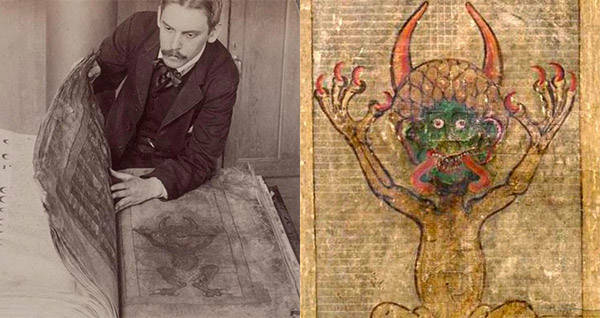 Enjoy this look at the Codex Gigas, also known as the Devil’s Bible? Next, learn about the Jersey Devil and its connection to Ben Franklin. Then read about how Aleister Crowley inspired Led Zeppelin and terrified most everyone else.